Panettone, croissants, brioche or baguette could be used, but my preference is for a medium-thick cut sliced challah bread, which lends itself well to the creamy custard soaking through. French toast is best when served warm – after resting for 5 minutes. 1. Whip the ricotta cheese with 1-2 tbsp. of heavy cream to loosen it up for ease of spreading. Add lemon zest and mix. 2. Spread 4 slices of the bread with ricotta, keeping most of the filling in the center. Spread the remaining 4 slices of bread generously with the Murabba. Close the sandwiches, pressing gently so they stay closed, especially at the edges. 3. In a shallow bowl, whisk the eggs with the milk, vanilla, cinnamon and salt. Dip both sides of each sandwich into the egg mixture until well coated. Let them sit for 20 minutes, turning every 5 minutes for even absorption. 4. In a large skillet, melt 2 tablespoons of the butter. Add 2 of the sandwiches and cook until golden, about 4-5 minutes per side. Repeat with the remaining butter and sandwiches. 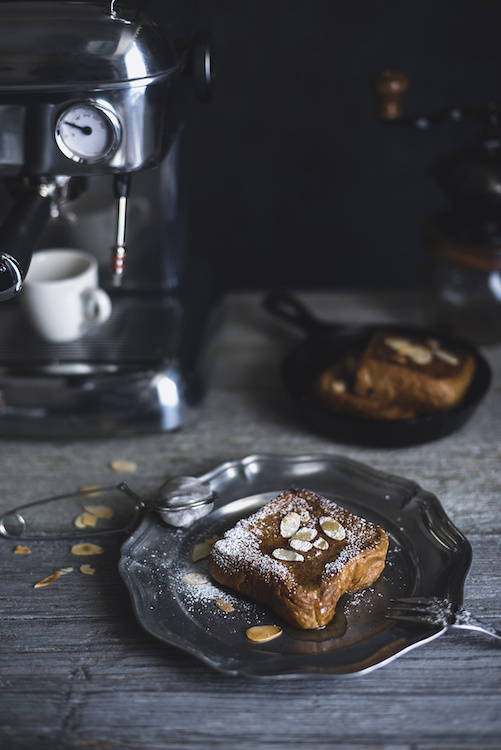 Sprinkle with almonds, dust with confectioners' sugar and serve with maple syrup immediately. In a bowl, combine the chili powder, turmeric, cumin, brown vinegar, and salt, and mix to make a paste. Place fish in the bowl and turn to coat all sides. Allow to marinade for one to two hours. Ideally, fry the marinated fish in the oil immediately before serving. Otherwise, simply fry the fish and keep warm in a covered warming tray or oven at low heat to prevent drying. To make the cauliflower rice, pulse the cauliflower florets in a food processor or grate with a box grater until they have broken down into small granules that resemble couscous or rice. In a pan, heat the olive oil over medium heat. Lightly fry the garlic, whole cumin, and chilies (if using). Add in the cauliflower and keep stirring until it is lightly browned and has a nice, nutty flavor, about eight to ten minutes. Serve with a nice big dollop of delicious Le Bon Magot White Pumpkin and Almond Murabba – the sweetness in which pairs really well with the heat of the fish. Preheat oven to 350F (175C). Grease and flour an 8 x 8 inch (20 cm) square pan. Cream butter and sugar until light and fluffy. Add eggs one at a time until mixture is whipped and lighter in color. Reduce speed to lowest setting. Alternate adding remaining dry ingredients and wet ingredients (rosewater or rose gin and White Pumpkin and Almond Murabba), starting and ending with dry ingredients. Cool on a wire rack. Can be served warm or at room temperature. Be sure to store any remaining pieces in an airtight container.